Introduction to Unit on Intolerance - We will be thematically dealing with Intolerance, but also offering a chance to learn about Poetry. Introduce our Unit with Magnetic Poetry! 7. Students then take their new words and create a “Poem” which is really just a non-sensical sentence. They can change verb form/tense and add 2 or three of their own words and punctuate as they like. 8. Have groups give their “poem” a title. 1. Hook: We will watch a part of an episode of WWYD. 2. Injustices of the past discussion. Have students experienced injustice? Profiling? Racism? Sexism? Any sort of prejudice. Share out? 3. Does Racism/Prejudice Still exist today free write and discussion. Unit will be framed around three types of discrimination/Privilege: Racism, Sexism, Sexual Orientation (lets look at the chart of rights and freedoms and see the other types of discrimination). 4. 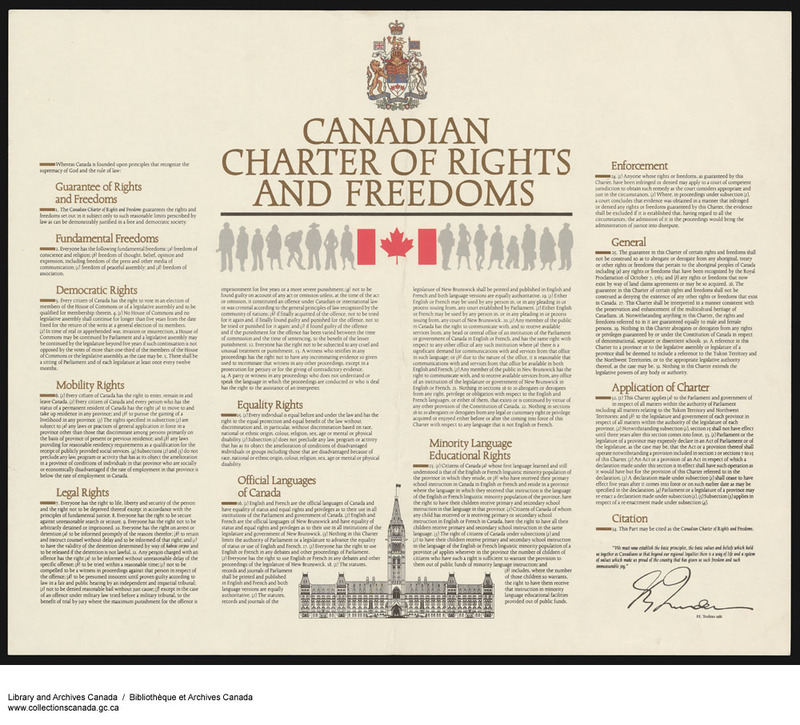 Look at the Canadian Charter of Rights and Freedoms - what does it guarantee us? 5. View Slideshow - Brief History of Racism in the USA - this will help us understand the Movie "Mississippi Burning." 6. Read "Dream Deferred" and answer questions about it. After reading the poem, we will have a class discussion where each student must ask a question or make a comment on the poem. B. What is the dominant poetic device being used? 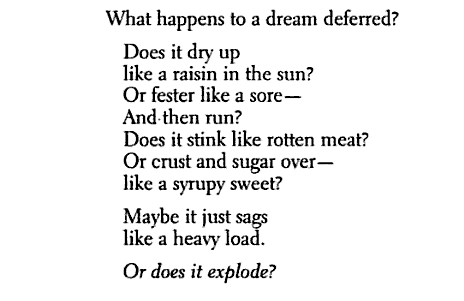 C. What is a "Dream Deferred"
7. Watch Martin Luther King Video... what is his dream? What is powerful about his speech? 1. Start by showing "Chris Rock Explains Racism" - discuss as a class. "White privilege is a set of advantages and/or immunities that white people benefit from on a daily basis beyond those common to all others. White privilege can exist without white people's conscious knowledge of its presence and it helps to maintain the racial hierarchy in this country." - Mount Holyoke College. 6. Hand out Jim Crow laws and get each student to read 1-2. Or students may use their mobile devices to read on Jim Crow laws for 5 minutes then report back to class. Show clip from "A Time To Kill" to display virulent racism. 8. Sweet Home Alabama was written in response. Circle any allusions you notice in it. 9. Play “Changes” by Tupac and get students to identify the theme and any poetic devices that they can find. ​6. Read Articles on Racism and Share out. Students will learn how to summarize and will have to summarize key points, include a picture and draw one significant conclusion from the article they choose. Will do this on one of the class white boards.